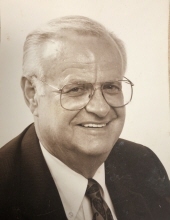 William A. Thompson, age 83, a resident of Naperville, IL, passed away peacefully and surrounded by the love of his family on January 21, 2019 at Arista of Naperville. He was born on July 27, 1935 in Chicago, IL. Bill is survived by his beloved wife of 24 years, Emma Thompson; his loving children, Michael (Nancy) Thompson, Patrick (Debbie) Thompson, Michele Thompson, William (Darla) Thompson, Prentice Thompson, Christina (Michael) Scott and Wanda (Warren) Hargo; his cherished grandchildren, Jessica (Michael) Jividen, Taylor (Ashley) Thompson, Melissa (fiancé Phil Kohlhagen) Thompson, Kelsey Thompson, Ryan (Emily) Thompson, Caden Riggs, Blake Thompson, Phoebe Thompson, Daphne Thompson and great-grandchildren, Poppy Thompson, Lauren, Mallory and Sam Jividen; his dear sisters, Kathleen (Scott) Sneeden and Trish (Dan) Tkachas well as a host of nieces, nephews, cousins and friends. He was preceded in death by his brothers, Arthur Thompson and James Thompson and his son-in-law, Jody Riggs. Bill proudly served in the U.S. Army. He graduated from St. Ignatius High School, earned his bachelors degree from the University of IL, Champaign-Urbana, and earned his MBA from the University of Chicago. He worked for over 30 years for R.R. Donnelly and retired as President of the Book Division. He also owned and operated All-Star Printing in Wheaton, IL. Throughout his life Bill was involved in coaching his children’s teams, Cub Scouts, golf, and several Junior Achievement programs. Bill was a huge Chicago Bears and White Sox fan. Visitation will be Wednesday, January 30, 11:00 AM until the time of funeral services at 12:00 Noon at the Friedrich-Jones Funeral Home & Cremation Services, 44 S. Mill St., Naperville. Interment will be private. To send flowers or a remembrance gift to the family of William A. Thompson, please visit our Tribute Store. "Email Address" would like to share the life celebration of William A. Thompson. Click on the "link" to go to share a favorite memory or leave a condolence message for the family.